In a touching show of solidarity with local wildlife, police and motorists in one Kentucky community put everything on hold this week to make sure their animal neighbors would make it home safely. Every year around this time when the Ohio river swells near the town of Henderson, countless deer are struck and killed crossing the highway toward higher ground. This year, however, things went a little differently. On Tuesday afternoon, at the request of local wildlife rehabilitator Linda Williams, police agreed to block off the road where a large herd had gathered, allowing them to cross without danger. It took only five minutes or so, but the difference it made for the animals was immeasurable. 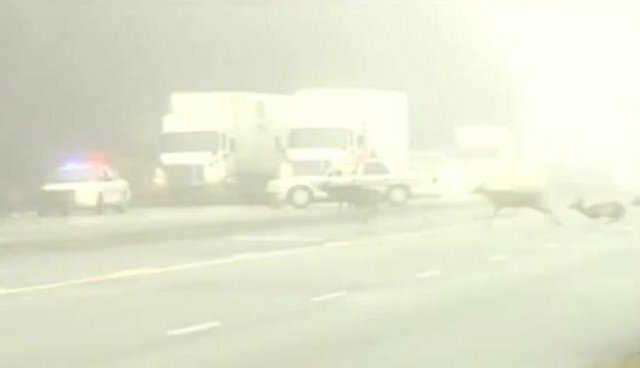 "This is the first time in history they've ever shut the highway down for an animal, let alone deer," Williams told The Dodo. "Everyone was really great about it. They didn't honk their horns; they didn't complain about it. They were really happy that the deer were not hurt." Despite the large number of deer deaths by vehicle strikes along the road, finding a solution had never been much of a priority before, Williams said. All it took to change that was for her to make just one phone call to police with the idea of how to help. "It was magical, having the community see that these deer were in a situation and the only way to help was to shut the traffic down," she said. "To have their support and the police department's support, it was really awesome. It almost made me cry." Williams said that the police plan to implement her simple solution in the coming years as well.